Swimming around in the clear blue water above a tropical reef is not a healthy place for a lone fish to be, especially when you are bridle rigged to a circle hook. Certainly the blue runner so tethered at the end of my line was not having the best of days, and by the way it was now frantically splashing around on the surface it was obvious that some hungry predator had noticed its plight. Moments later, just a few yards to the side of the bait, the comb like dorsal of a rooster fish sliced like a knife through the glassy surface film, and in a boil of water snatched the runner. I had been fishing with the reel in free spool, checking the flow of line with my thumb, and as soon as I felt the fish grab the bait I allowed line to flow freely out through the rod rings. I counted to ten, re-engaged the spool and allowed the line to steadily tighten, waiting for the circle hook to find its sweet spot in the corner of the fishes jaw. On lifting the rod it immediately assumed a healthy bend, thumping in solid confirmation that I was connected to yet another decent fish. 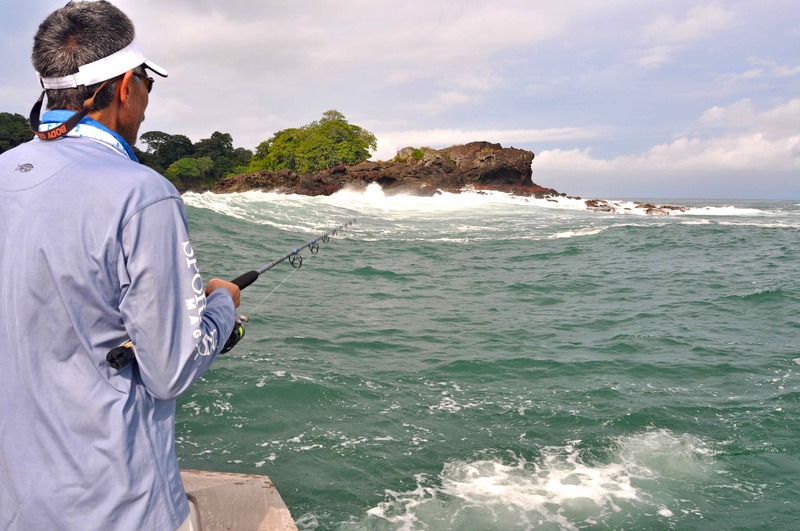 I was fishing the rich waters around Isla Las Perlas, a verdant archipelago of lush, tropical islands you’ll find located in the heart of the Gulf of Panama. In pre-Columbian times these islands were ruled by an Indian king, whose main occupation was pearl diving. At the time most pearls in the world were collected in these waters and were much in demand, pearls were used both as an ornament and to trade with. 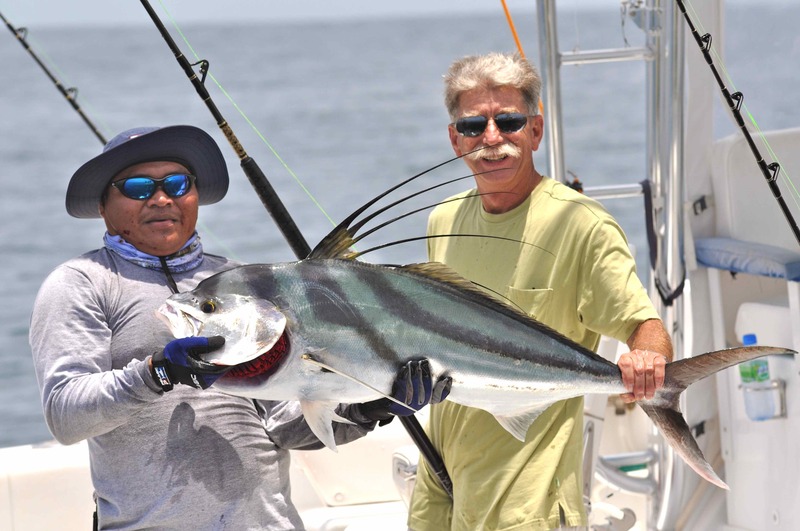 Since the early in the 20th century pioneering anglers such as Zane Grey have written enthusiastically about the amazing fishing available off the coast of Panama. 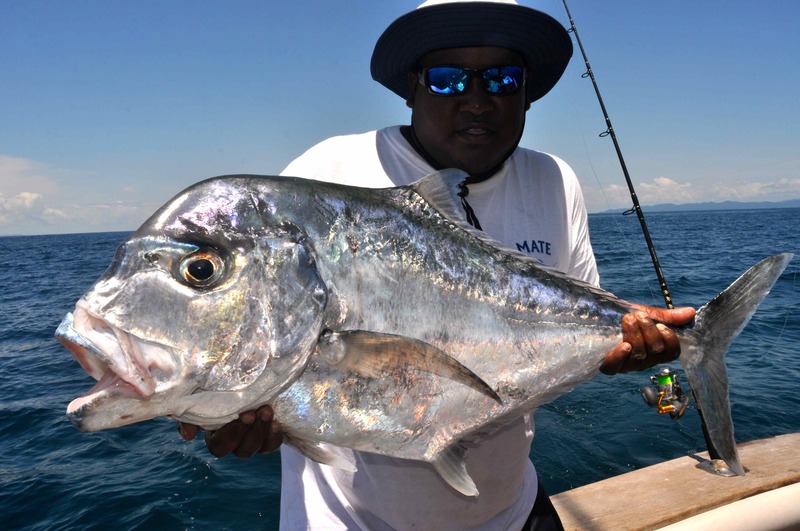 Today this small country is recognised as being one of the worlds great salt water sport fishing destinations, regarded by many as being one of the very best places to fish for marlin, sailfish, tuna and the host of other species of saltwater pelagic fish that are abundant offshore. The inshore fishing grounds, too, are equally rich. Fishing within hailing distance of the jungle canopy you can catch many varieties of game fish, including hard fighting cuberra and mullet snapper, numerous species of grouper, sierra mackerel, African pompano, jack crevalle, wahoo, dorado and perhaps that most sought after species of all in the tropical eastern Pacific, rooster fish. 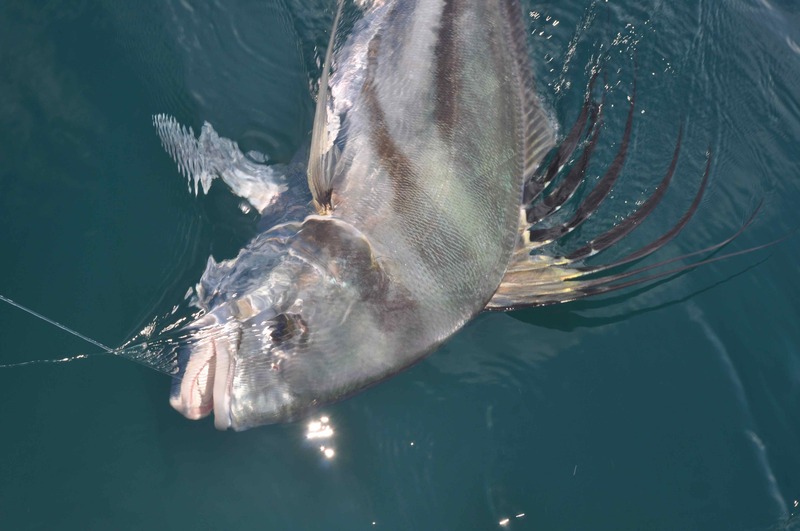 Rooster fish are without question one of the world great species of sport fish. 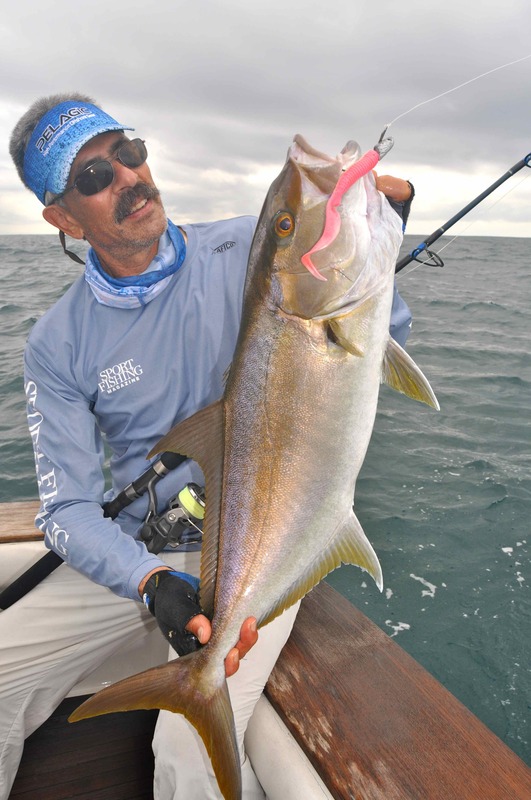 They are a truly beautiful and immensely powerful member of the jack family, and can be caught on pretty much most techniques from casting or jigging lures, to live baiting. 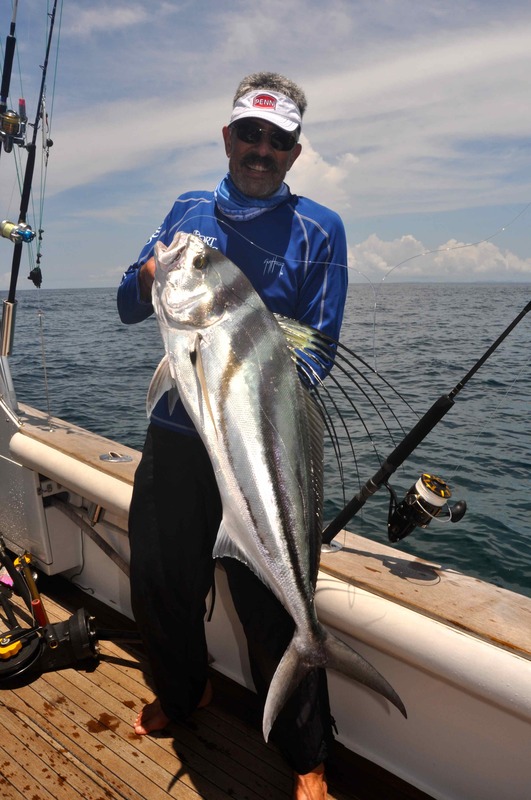 Ideal territory for rooster fish are areas featuring a profusion of shallow banks, reefs, tide rips, isolated outcrops of rock and small islands, and unspoilt sandy beaches that are continually swept by a powerful, rolling surf. Isla Las Perlas could have been designed with rooster fishing in mind. 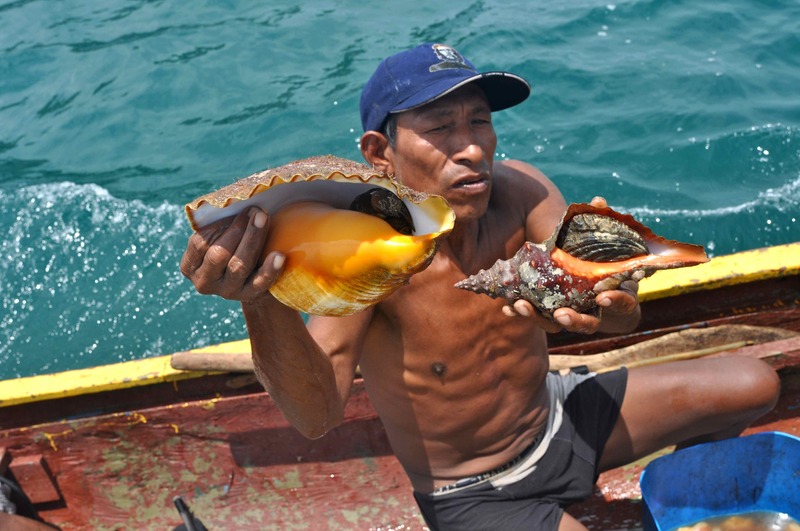 My trip to the Las Perlas Islands came when an unexpected email pinged into my inbox. It was from Doug Olander, Editor in Chief of Sport Fishing Magazine in the US, one of several overseas magazines I contribute to. Would I like to join him on a trip to Panama? 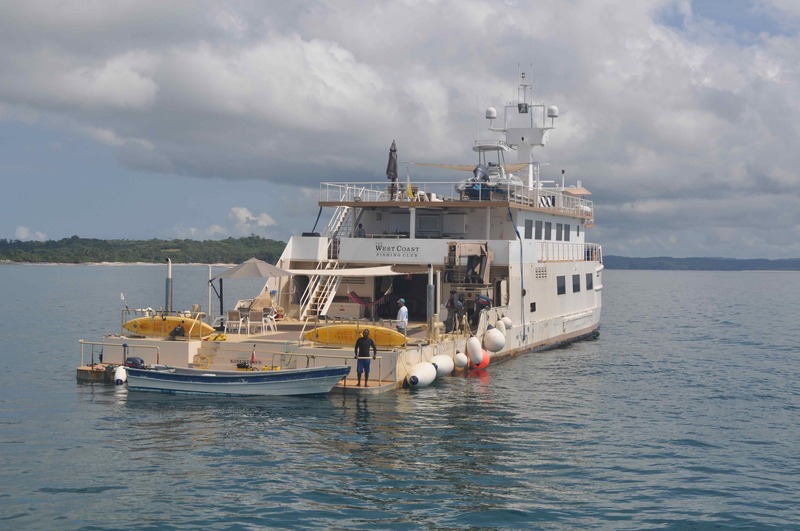 We would be spending a week living aboard ‘Pacific Provider’, a sumptuous live aboard boat, and fish each day from dawn until dusk aboard smart new game boats with the emphasis being on working inshore, rather than out in deeper water for billfish etc. As you can guess, it was a tough decision! 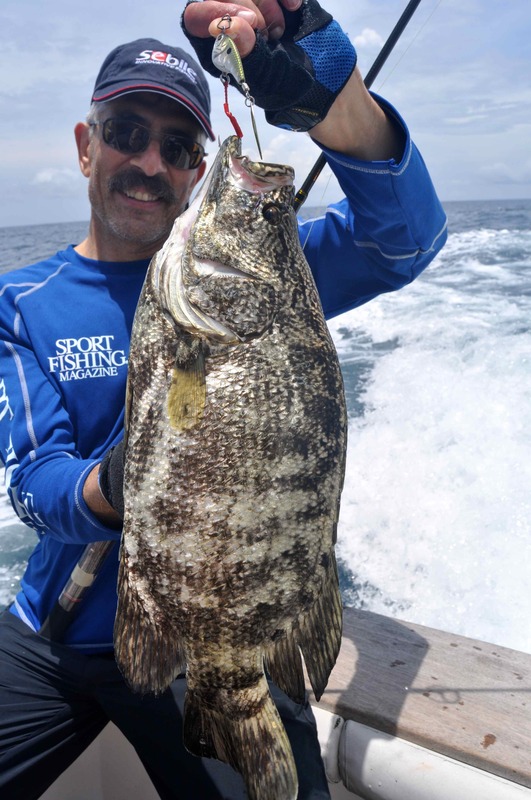 Like Sea Angler here in the UK, Sport Fishing is the number one specialist saltwater fishing magazine in America. It’s a great publication and obviously focuses on saltwater fishing throughout the US, almost exclusively afloat. 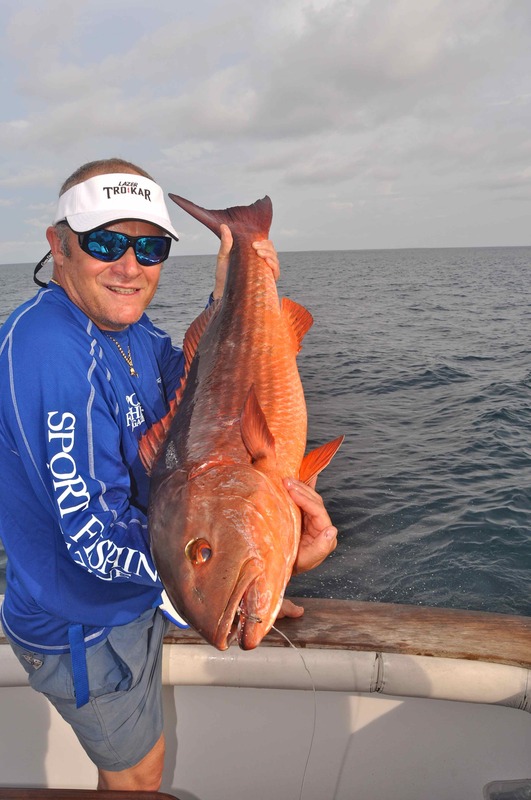 It publishes in depth, informative articles covering a wide range of subjects such as the latest saltwater tackle and techniques, as well as frequent articles on fishing the worlds great saltwater angling destinations. I suppose the biggest difference I have noticed during my time working on the two titles is reflected by the size of the countries each magazine targets, which is reflected in their respective editorial. For example, a good days charter fishing for cod out of say Whitby, as published in Sea Angler, would be of interest to most British sea anglers, most of whom could easily aspire to take make the trip themselves. 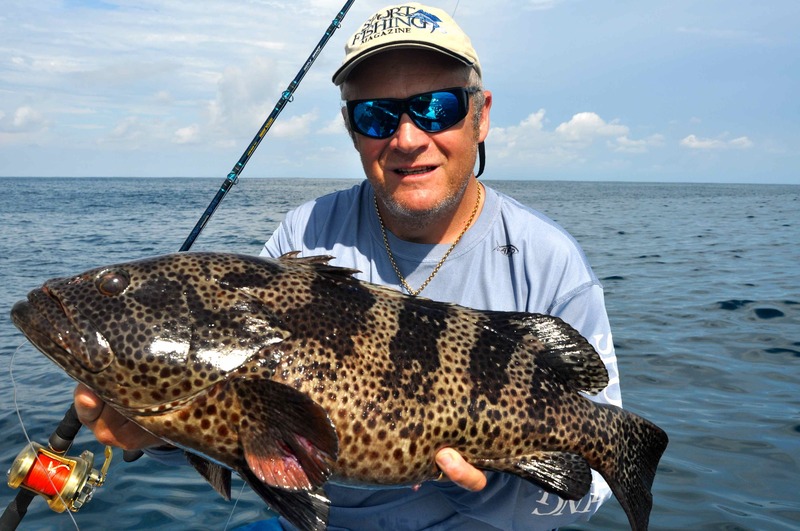 North America is a continent and its a long flight from the east to the west coast, or from Maine south to Florida, so articles need to have a much broader appeal in order to connect with the continents readership and their respective interests in saltwater angling. 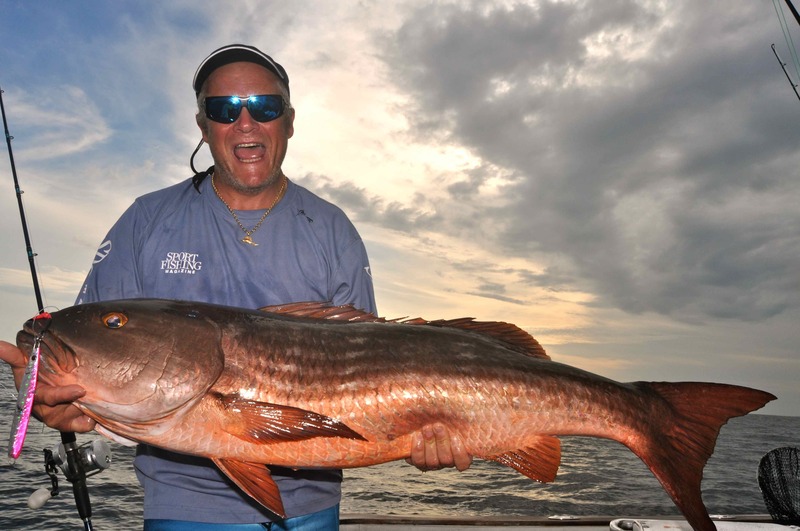 With this in mind a lot of pre-planning goes into the editorial content of Sport Fishing, it has too in order to collate sufficient material to produce the correct balance articles that it does. Following a night at a hotel in Panama City, we boarded a diminutive 6 seater aircraft for the twenty minutes flight across the Gulf of Panama to Isla Las Perlas. We landed at a rough airstrip that had been cut into the jungle at Punta Coca on the south-western tip of Isla Del Ray, Island of the King, which covering 90sq miles is the largest of the Las Perlas Islands. A short drive in a golf buggy took us to Bahia San Telmo, a remote and truly beautiful beach from where we were transported out through a heft surf to Pacific Provider, which lay at anchor a short distance offshore. An hour later we were fishing. By the time we sat down to our first gourmet dinner that evening Doug and I had already caught some pretty amazing fish, certainly both of us had been kept ‘busy’ working away with our cameras. Fishing free-lined blue runners we had taken several huge and immensely powerful mullet snapper, a species new to me, along with some big, brute, golden flanked amberjack, and even more species that were knew to me, but which invariably Doug was able to identify. We had returned to the mothership pretty pleased with ourselves, but soon learned that bragging rights that night at the boats well stocked bar were clearly held by Randy Welch and Mike King from Washington State. 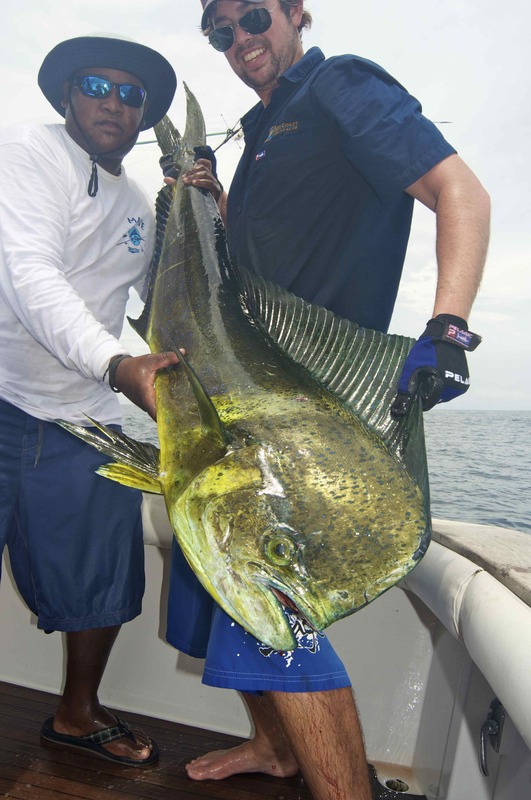 They had released five big roosters, three estimated at over 50lb, the biggest a truly immense 85lb. 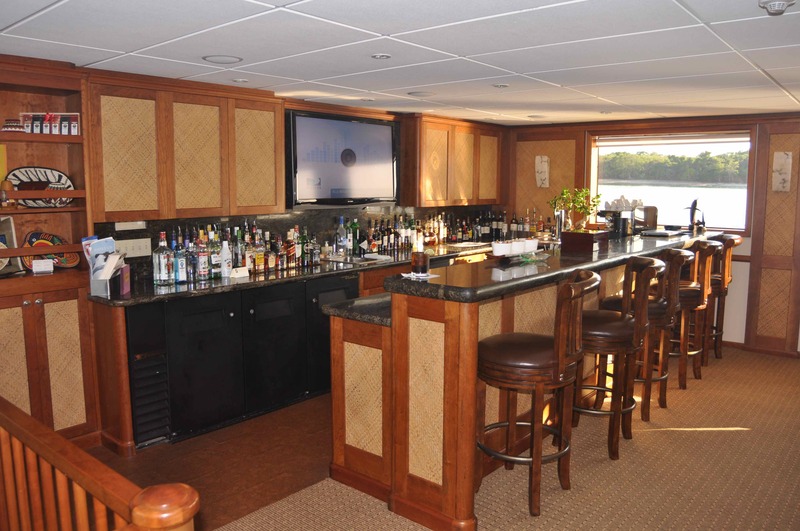 Yes it has a bar! “In order to make a gyotaku print, one places the subject on a wooden bench and paints one side with sumi ink. Next a piece of paper or other material is laid over the ink-covered fish. Finally, one rubs the material until there is the image of the fish on it.” In 1994 Doug’s interest in Gyotaku culminated in the publishing of a book containing 53 of his original prints; Gyotaku Fish Impressions: The Art of Japanese Fish Printing-you can check it out on line. 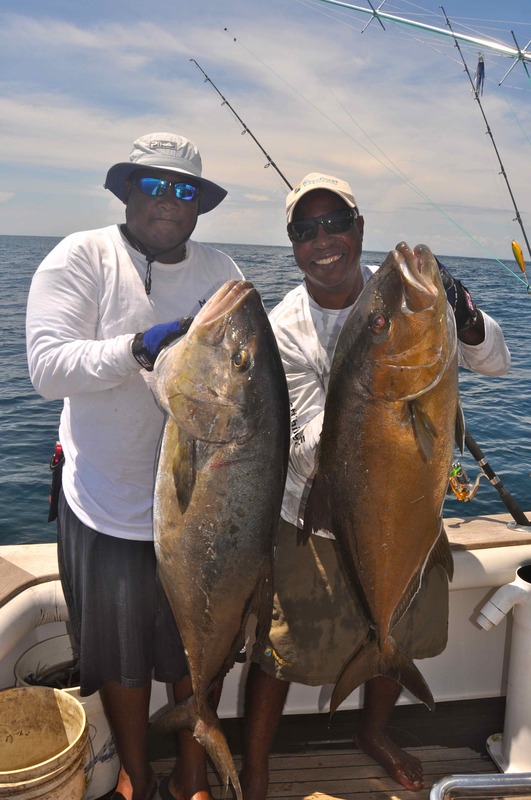 Over the next few days we fished the area around the Isla Las Perlas extensively, occasionally venturing as far as the Panamanian mainland, not far north of the Columbian border. Mostly we alternated between slow trolling live baits and popping and jigging. Standing in the cockpit of a well equipped sports boat as it gently rises and falls in the ever present Pacific swell, casting huge surface poppers into the foaming surge of water as it crashes over the rocks that fringe a dense jungle coastline, a jungle that constantly emits a cacophony or strange noises, is a breathtaking experience. Watching a large and powerful fish suddenly appear from nowhere and demolish the lure in an arm wrenching smash of a take is indescribable. I think you can see I was pleased with this fish caught on a Shimano Butterfly Jig! Buying that evenings dinner from local fishermen, yes they tasted as good as they look! It was a most memorable week fishing amidst the most amazing surroundings imaginable. We both caught a lot of fish, and we both lost fish, and I could fill many pages reliving my adventures. 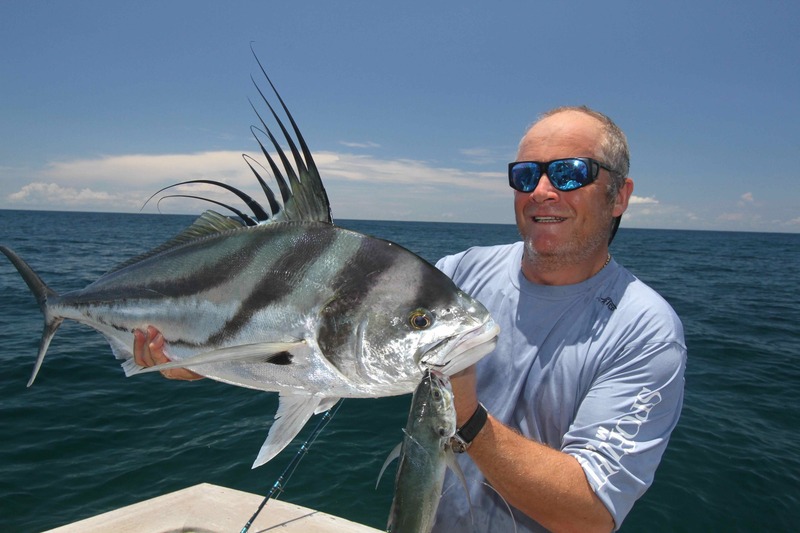 Highlights included catching my best rooster fish, a modest twenty five pounder. Then there were those mighty mullet snapper, unbelievably powerful fish that are as eager to rise to an aggressively worked surface popper or smash at a speed jig as they are to eat a livebait. Late one afternoon Doug and I borrowed a couple of the boats kayaks, paddled the short distance across to the shoreline and dragged them over the beach into a landlocked mangrove lagoon. Paddling among the lagoons resident population of caymans while working small surface poppers amidst the tangle of mangrove shoots, we caught numerous small cuberra snapper, and I got my first Pacific snook. 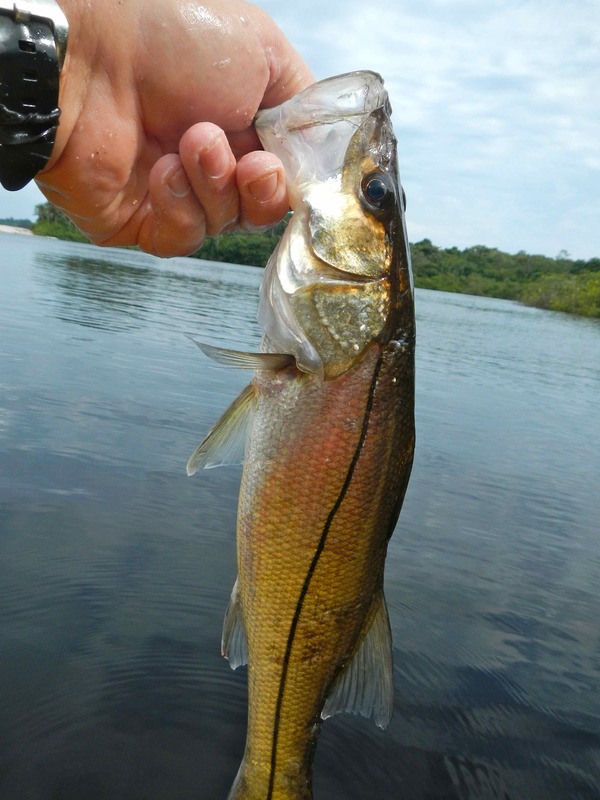 Yes its a baby, buts its my first Pacific snook! 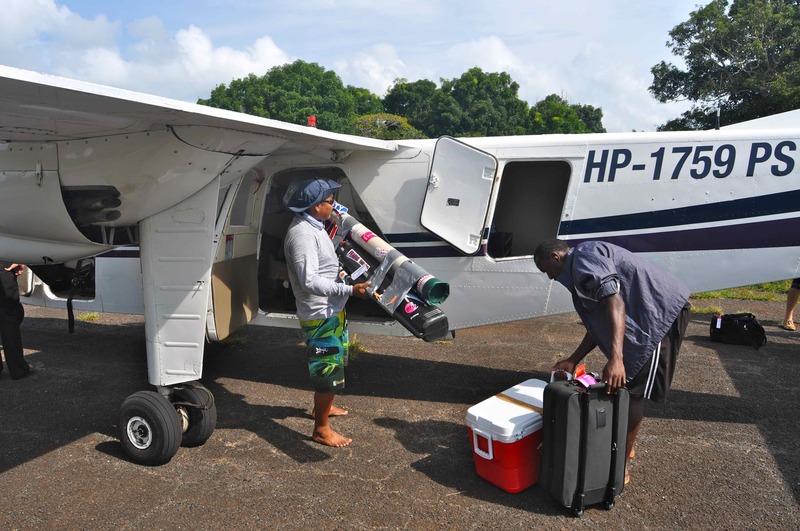 All too soon we were back at that remote jungle airstrip, shaking hands and swapping stories with the next weeks group, loading our mountain of gear into a diminutive aircraft for the flight back to Panama City. Certainly I will be back, I’ve yet to explore the offshore fishing. This aside, the photo I have of Mikes 85lb rooster fish is haunting me badly; I want one!